A conversation about university education today that rearranges some of the deckchairs on the Titanic. 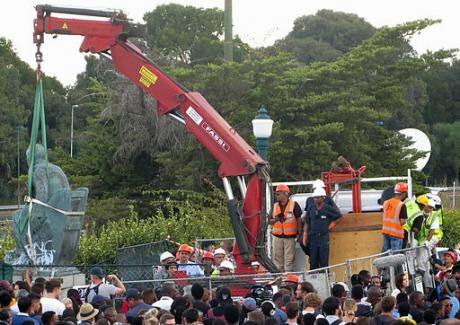 Cecil John Rhodes statue removed from University Of Cape Town on 9 April 2015 after concerted student protest. Tony Carr/Wikicommons. 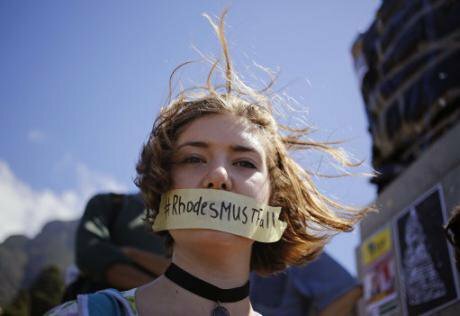 Some rights reserved.Rosemary Bechler (RB): What is the relationship between the safe spaces furore in the States and the Rhodes furore and the South African furore… Are they linked? Are they part of one great global identity crisis? Or are they different in nature, with very different implications for social justice? 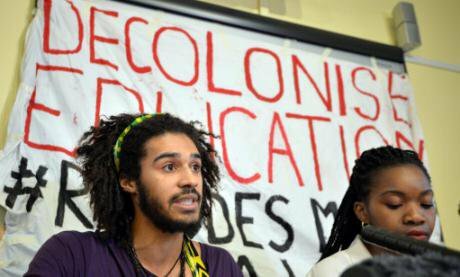 Paul Gilroy (PG): Of course, the African American campus eruptions, particularly at elite institutions; the things that are going on in Oxford with regard to the Rhodes statue and the process in South Africa – are linked. The internet links them. A shared vocabulary links them. They all employ a constellation of concepts that has resonated differently in each location but is clearly another connecting factor: decolonization, privilege, safety. In different ways, all those examples betray the damage resulting from institutionalised racial hierarchy. However, I would want to try and distinguish them. It is almost as though — epistemologically-speaking — the critique of the national state and the limitations of methodological nationalism have yielded an orphaned cosmopolitanism. We can drift back into the bad habit of imagining that the kind of analysis we articulate is good for everywhere and for always, or somehow floats innocently between those different locations. RB: A bit like reductive readings of the Black Atlantic that talk about water and flows and such like? I found myself asking, ‘Surely there must be underlying all this an identity question in general?’ And then pulled myself up, thinking, ‘Well, what on earth is ‘an identity question in general’’? Isn’t that a contradiction in terms? Part of me wants to say that this is a new era, and part, that if you try to grasp any identity politics seriously you have to deal with that politics in its own terms, very precisely, in space and time. PG: We have to be accountable for the way in which we gamble and try to put spaces and times together. It’s difficult for example to think through the three cases you raise without placing them in a temporal sequence: Africa behind, UK in the middle and the US ahead. I think that would be an error. Let’s distinguish them, but acknowledge how they shape a common present — are part of the same historic moment or conjuncture. You’ve mentioned Black Atlantic. I don’t talk about that much nowadays, but I have always been quietly influenced, as many people have, particularly feminists, by Adrienne Rich, and her argument about the politics of location. It connects with the penumbra of discussions around the feminist re-writing of Gyorgi Lukacs, by people like Donna Haraway and Nancy Hartsock as well as the other voices involved in a conversation about “standpoint epistemology”. 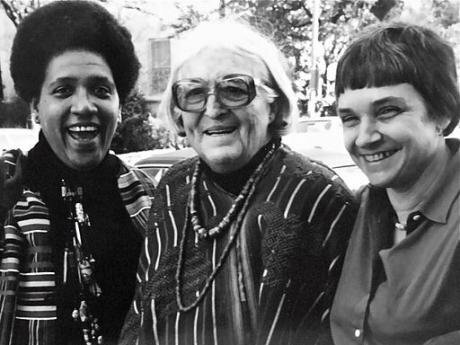 Audre Lorde, Meridel Lesueur, Adrienne Rich at a workshop in Austin,Texas, 1980. K.Kendal/Wikicommons. Some rights reserved.For me, Black Atlantic was about trying to find some intermediate way of connecting places via water and transforming the understanding of culture accordingly, but at the same time having to acknowledge that translation, transmission and transformation were part of a systematic making of politics that couldn’t be flattened out too much. Obviously language plays a part. I was looking at certain elements of European political culture connected to the history of slavery. So someone like Richard Wright, whose work was located at the meeting ground of Anglophone and Francophone politics, was a useful way of thinking about this. Du Bois’ relation with German thinkers could provide a second example. However, Black Atlantic emerged from a firmly pre-internet way of approaching cultural flows and influences. The problem now is one of time — simultaneity — and the bad political habits that arise from the seductions of the immediacy that computer-mediated political communication affords you. By sharing a vocabulary and rehearsing it as if it can subordinate an unruly world, people do feel an immediacy that cuts into their loneliness, their isolation. The appeal of generic identities is enhanced by those mediations. It’s easy to imagine, wrongly, that we all share a common location. So, for many of the young people at the college where I work, Beyoncé’s spectacular performance at the Superbowl provided a more vivid experience of black politics than a lot of the events that are evolving outside the windows of our institution. I was very struck how, in the aftermath of that moment (whatever one thinks of it) that young activists on Twitter said things like: “These photographs of our demonstration I’ve just uploaded remind me of Beyoncé at the Superbowl!” Obviously, the godlike image of a “black Bill Gates” is a very potent one at the moment. Things become really scrambled in that virtual world, and certain illusions about the difference between a movement and a network are easy to hold onto. I think that is a significant loss. The pace of all this and the deadly pressure on language that results have to be taken into account. 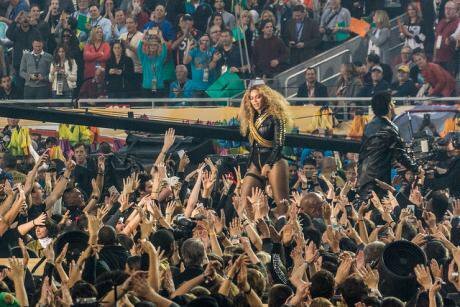 Beyonce, Bruno Mars, February 2016. Arnie Papp/Flickr. Some rights reserved.I am not saying that Instagram and Black Twitter for example, aren’t important. They are extremely important, but not in terms of the investment they make in language. There are Haiku twitterers, I suppose, though not in a large number. For me the pressure on language is a big part of the political signature of this time. By sharing a vocabulary and rehearsing it as if it can subordinate an unruly world, people do feel an immediacy that cuts into their loneliness, their isolation. That shared poetics helps them to constitute a virtual community which may be widely dispersed — inside and beyond the citadels of over-development. There is an almost theological aspect to it too. It is almost a sacred phenomenon because there are doxa, iterations, responses, and if you are lucky, probably a bit of transubstantiation will happen! I’m really aware of the impact of this on imaginative thinking. They don’t talk about racism any more, they talk about anti-Blackness, the ‘black body’, and they borrow a bit from Dorothy Roberts or from Lewis Gordon. It contributes to the pot-pourri of new age confectionary. RB: Todd Gitlin contrasts the outrage felt by students of colour on campus in the States and the feelings of discomfort they have there for good reason, with the predicament of the black poor being killed by the police in American cities, which led to rise of the #BlackLivesMatter movement. He would want the one instance not to be “flattened out” by equation with the other. Would that be a fair use of your term? PG: I don’t think of Todd Gitlin as an antiracist activist. Without that kind of serious commitment, one has to be hesitant about the authority that is inevitably bound up in that kind of diagnosis. But it’s a good example to think through. When Princeton professor Imani Perry got picked up by the police for her parking tickets and they handcuffed her, this became a powerful example of how these things can meet. Of course, one has sympathy with her situation, but the position of black middle class in the USA is not consistently and automatically interchangeable with the intractable predicament of the black poor. Of course, there is a way of thinking about racial identity which makes African Americans in this sort of instance absolutely interchangeable with one another. Hierarchy and contempt are institutionalised and the result is violence. But everyone is not vulnerable to the same degree all the time. The Ground Zero of this approach used to be the idea that black americans couldn’t catch a taxicab. I always thought that was a bit ridiculous. But it is interesting how it was staged by different writers, different thinkers, until the fact that you couldn’t catch a taxi because people drove past became a core manifestation of structural racism. London is not New York. New York is not Chicago, St. Louis or Birmingham, Alabama. We need a really good new map of the political geography involved. One night years ago, I was going to a big meeting in Harlem with various black political luminaries. We were downtown and all the taxis were driving past us. So the least “visibly black” among us stood at the kerb while the rest of us hid behind the parked cars. When a taxi slowed and stopped, we jumped out merrily and got in. It was a black taxi driver. He said, “You’ve got me. I don’t want to go to Harlem, but I’ll take you up there because you tricked me!” The structures are complex. There were black cops involved in killing some of those black people and in covering up the crimes. The world doesn’t conform to our Manichaean fantasies. I don’t want to be misunderstood. Vulnerability to the arbitrary violence of trigger-happy police is a real risk and a grasp of that vulnerability is a far better staging of the tense moment when racism enters than the old kerbside tableau. But . . . I don’t think that all people of colour are always equally at risk from the historic forms of violence associated with a deeply and brutally segregated society. To simplify things that much is unhelpful. Hackney is not Brooklyn. London is not New York. New York is not Chicago, St. Louis or Birmingham, Alabama. We need a really good new map of the political geography involved. RB: You make the point that these are élite universities we are talking about in the States and in Britain. PG: Yes, élite universities which have all followed a certain strategy with regard to diversity management. Diversity management means, for example, that the main burden of offering your diverse student body a sense of safety and security and recognition of your worth and cultural value is not actually a result of the curriculum or as a result of teaching. Academic issues are in some ways secondary. Meeting the needs of the black and brown students is really something that happens in the pastoral environment. In the case of Yale — the case I know best — it was managed outside of the residential requirements of the student body. The great US pentagram of racial identity: black, white, native American, Asian, Hispanic was reproduced in the institutional form of cultural houses provided for the support, nurturance and care of under-represented minorities. The great US pentagram of racial identity: black, white, native American, Asian, Hispanic was reproduced in the institutional form of cultural houses. In those spaces, appropriate events would be put on and bonding and connection could be established between the different yearly intakes of students. They would revel in that supportive commonality. So for example, when the students graduated, alongside the official graduation ceremony there would be another, second graduation for people of colour and their families. I don’t know if this practice continues, but I discovered it because a student I had been teaching invited me and said “I know you aren’t keen on identity-talk, but you were my teacher and I’d like to honour you. Will you please just come and take part and receive my symbolic gift of Kente cloth.” I was touched by his request and said, “of course I’ll do that”. I sat there for hours while various people received their Kente cloth from the appreciative graduating students. The audience burst into tears and clapped with pride. They sang the African American national anthem, ‘Lift every voice and sing’, which is quite a challenge if you don’t know the meandering tune. As the happy spectacle unfolded, these young people’s fantastic achievements would be announced and lauded. Some would be heading off to do law at Harvard or Genomics in Stanford, going off to medical school etc. 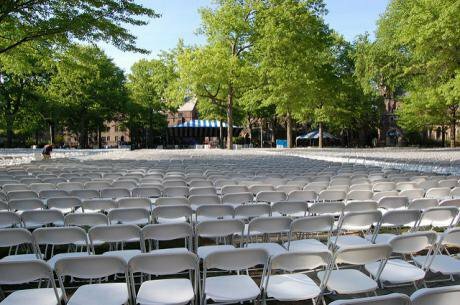 Academic Commencement '07 (Old Campus, Yale). Alex Guerrero/Flickr. Some rights reserved.All of this was rapturously received as it should be. But as it unfolded, I began to realise that I didn’t know many of the people we were cheering. I was Chair of African American Studies. Few of these high achievers had come anywhere near our department. Almost none of them, I began to realise, would dare to sully their precious transcript with the idea that they had actually taken a class in our academic area. I suspect that Jim Sleeper is probably onto something in the way he sets the discussion up about safe spaces, by looking at the institutional dynamics. Robin Kelley has also made a point about the limitations of approaching the university as a dwelling or home. African American studies, Native American studies, ethnicity, race and immigration, these are all routinely departmentalised in the élite universities. However, the registration for those classes is not something that “minorities” want to do — I haven’t seen the figures for a few years, so I don’t know for sure. But my hunch is that among that élite, the way that they connect with these issues is not through their actual education at all. There are always a few exceptions, but the vast majority look at African American Studies the way those people who will evaluate them look at African American Studies — as a luxury item at best, and as a distraction and a fraud at worst. That was a shock actually — a bit of a discovery to realise that this emergent black elite, (of which President Obama is the supreme representative) had such a distance from those critical forms of knowledge. RB: I missed that point. I thought that Jim was saying that these students were trying to set up ‘culturally-based’ sorority houses as ‘safe spaces’ in reaction to their feelings of neglect by the mainstream. PG: Outside the élite places, they are doing that. But what I’m saying is that in the US, the elite universities accepted and endorsed those very expectations as a means to keep their minority students comfortable if not content. As things unfold, I’m sure some good things will have come out of all the anger at Yale. It was shocking to listen to friends who have taught there a long time saying, ‘My years of humiliation at the hands of the university have finally found a voice..’. It had obviously touched something in them, and while I don’t believe you can resolve all the questions being raised by this movement through the appointment of a more diverse faculty who are expected to mirror the experiences of the student body, I think there have been real injuries. I recall a kind of quiet racism in the meetings of the Yale Professoriat where nobody would speak to me and many looked at me — even in my best suit — as if I had come in there on the bottom of somebody’s shoe. So I know that injury can build up over time and people get understandably bitter about it. Of course, these are not only US problems. In many ways, my own experience in UK universities was worse. But they are still nominally public bodies and the impact of diversity management is obviously very different here in the UK. RB: Diversifying faculty properly — whatever that would mean — doesn’t really get us very far away from the in loco parentis problem does it? — the infantilising nature of these protests, which always seem to be appealing to a Mum or Dad who is behaving badly and from whom one wishes for more attention. What about a recognition of the power relations involved? Take the piece we published about what was going on at Oxford by Jörg Friedrichs and Ryan Berg. They argue that we need to adjust the forms of humiliation so that everyone can reconcile themselves to them more easily — like rearranging the deckchairs on the Titanic. But at no stage is there a recognition that a very reprehensible form of unequal power relation underpins the whole history, and that these student protests might actually be aimed — wittingly or not — at changing those power relations. Andre Dallas from the Rhodes Must Fall In Oxford group, February 2016. John Stillwell / Press Association. All rights reserved.PG: I have a “methodological” question about where we should start this part of our conversation. I don’t think there’s much to be gained (outside of Oxbridge) by yielding to an Oxford-centred discussion. That isn’t the right place to begin. Nor, actually, is the Yale campus. It seems to me, that we should also ditch the assumption that these problems can be fixed by appointing more black professors. What are those lucky appointees going to do? How are they supposed to rise differently to today’s challenges? I have been a university teacher for more than thirty years. When I started out, working in what was considered to be a very lowly place, I discovered that it was a wonderful place, the best and most rewarding that I’ve ever taught in. Initially, the black students related to me pretty ambiguously. I think that they saw the fact that they had a black teacher as a kind of confirmation of their own secondariness. I had to work very hard to disaggregate that assumption so that we could learn together. I will always remember how upsetting that was. It was really complicated. My value to them changed once they saw me on television or heard me on the radio. The experience of diversity in education extends beyond a “safe space” or loco parentis thing. That only applies strongly in élite universities where students live together, bond for life and join the same secret societies and march as a single cohort into the fortified bunkers of the 1%. Nigerian-American writer Teju Cole, 2012. US State Department/ Wikicommons.The other thing I ought to point out, and another reason why Obama is such a perfect example, is that though I had imagined many of those young people to be African American – very few of them actually were. They were more often of Caribbean parentage, or they were actual Africans, the children of business people, relatively wealthy people. Look at the literature they have been creating recently — Americanah, We Need New Names, Ghana Must Go. Think about the debates over Afropolitanism raised by those young, mostly female novelists. 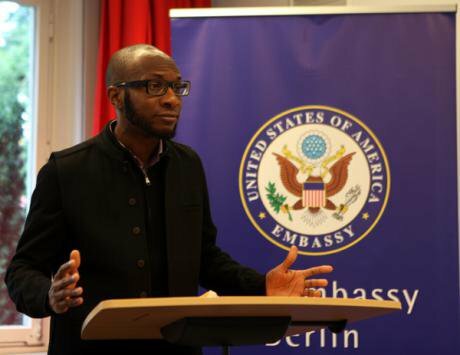 Teju Cole is the major male representative of the same generation. They are not African Americans from the traditional mould or by immediate heritage. They find themselves uncomfortably being lumped in with the historic results of Atlantic racial slavery, this ‘black thing‘ that, in many cases, they are having to discover on the fly. There might be very good reasons why they want to identify themselves as African Americans but this body of work suggests a degree of ambivalence. The fiction they’ve produced is interesting. Those novels show how that post-slavery blackness might be negotiated and how it may eventually start to lose some of its historic power. Africa is important in the future of the US. A new stratum of commentators will be its brokers, advocates, champions and ambassadors. RB: If these are not the places to start Paul, where is the place to start? PG: This may indeed be rearranging the deckchairs on the Titanic but we are on the Titanic, so let’s think about it! In Britain, a better place to start the conversation might be to focus on the attainment gap of “black and minority ethnic” students. Why do those students, despite all the honest efforts of the universities who are anticipating being beaten up by the government on this very point — why do they still fare worse than their white peers? This is confirmed by every bit of research that has ever been done. That consistency suggests the power of structural or institutional racism operating independently of the individuals who act it out. That’s probably a better place to start. It isn’t a problem that can be solved comfortably by the managerial fix of saying, “Let’s get more black staff in to teach them and then it will all be alright.” One recent evaluation I received included a passing comment saying that one of my classes wasn’t ‘a safe space’ for black students. RB: What could that possibly mean? PG: I think it means that I wasn’t offering the scripted responses warranted by internet racial politics. I wasn’t, for example using the term: “anti-Blackness”: I wasn’t saying, “intersectionality” to mean the same thing they mean. That key term is increasingly employed as a shorthand to mean black, female and queer. As I understand it, it is a perspective that allows us to examine and explore the complex relations of power — class, race, disability, gender, sexualities — that exist between and flow through all of us. Within the confines of my professional responsibilities and my “duty of care” I prefer the idea of my classroom as a dangerous space. This updated language of identity politics is spread, virally, via the computer. If you don’t follow the resulting doxa you are likely to become an object of the ‘call-out culture’ – which is where people get told off and bullied either into silence or agreement. It’s equivalent to the routine neoliberal moment of evaluation – “Was your driver polite?” “Did you enjoy this conference?” swipe left or right etc. You may not know much about this because you were probably too busy in your time at university reading books and talking about ideas. There is no point in being nostalgic about that lost era. I’m just using it as an example. When I read that comment about my teaching I thought to myself — I’m being told that I’m not making a ‘safe space’ for students of colour — is that what I should be doing? Within the confines of my professional responsibilities and my “duty of care” I prefer the idea of my classroom as a dangerous space. It fits with my sense of the university as a unique environment where special rules apply with regard to disagreements and where we acquire a special kind of discipline with regard to the foolish or loathsome opinions of others. I have tried to assist and support every student of colour who has banged on my door. I’m still doing it for students from places I no longer work at. If they come for my help, they will be helped. So I’m wondering, what kind of experience could I have offered that student that would have made a difference to them? But I’ve tried to think what their sense of un-safety might entail. I can’t reconcile my sense of my calling as a teacher, as an educator, as an academic, a researcher, as a scholar, with the idea that I should be offering therapy in the classroom! As Todd and Jim have picked up in relation to Yale students, there is certainly a need for therapy. I realised years ago that I sometimes had to acknowledge that. There were times I would say, “Therapy has its place. And you have to find the right therapy for you. But what we are going to do in this course is not that.” Sometimes when talking about racism things got very heated. Those issues cause a problem in the world, and everybody feels themselves to be an expert in this area – so why wouldn’t they cause a problem inside the university walls? Experience has become sovereign. There was no inhibition about the freedom to speak. Let’s accept a case for therapy. But let’s not start doing that in the classroom. There was no inhibition about the freedom to speak. Let’s accept a case for therapy. But let’s not start doing that in the classroom. RB: All the ‘safe spaces’ discussions we have been referring to talk about this medicalization of academe, and how students now wish and expect to be ‘made psychologically whole’ by attending a university that is more like a ‘home’ than anything else… but how does that actually relate to the underperformance of black students: is it cause or effect? PG: In places like Yale, the students do live in a little community and the medieval monasticism of that is a real, and for many, an exhilarating, formative experience. Everybody gets assigned to a college. There are things about that which are wonderful. I don’t like the price tag that is put on it but it can be a beautiful thing. Whether it translates very far outside that environment is another matter and I don’t think that is what is going on in the UK. I have no knowledge of Oxbridge but I don’t think students here aspire to that sort of wholeness. They’re too busy with their jobs and anxieties about debt. To get back to the translation of ‘safe spaces’ discourse into UK conditions, I don’t think most UK students know what it might mean to create ‘safe spaces’ in the institution. A high percentage of students are now bringing in notes from their doctor saying that they are suffering from depression and or anxiety and taking medication for those conditions. They are medicalising and medicating themselves in response to high levels of stress. We have the most unhappy young people in the overdeveloped world. This may have an extra resonance for broadly-defined “students of colour”, but it is actually a larger generational problem. Safe space might be better articulated as “anxiety-free” space. RB: It surely is. I’m thinking about the high incidence of suicide rates of black students in universities in South Africa, and I feel in a way when I look at these things that they are mirror images of each other, and that this might be a particularly stark example, leaping out at one – but that it is precisely that, a symptom of a more general cause. There is something going on across the whole piece that is consistent with the atomisation of individuals, making individual lives their problem – for them to be miserable about, and to do what they can to defend themselves – on their own. The first thing that strikes me is that this is not about persuasion, or spaces for dialogue at all. And that is what worries me. PG: I try not to go into the meeting spaces that the students have created for themselves. I suspect that the weather changes if I do. I’m sure that they do talk and do debate. All organisations seem to share the same pathologies, so I imagine that questions of hierarchy always have to be dealt with. When I went to the occupation in King’s to express my solidarity, I was asked rather pushily if I was a student and how did I get past the security guards downstairs? Once we had established my right to be in the room, everyone was perfectly lovely and delighted to talk and it was a very interesting and rewarding conversation. I hold out for education, not as a credentialising process, but as encouragement for the revolutionary force of individual curiosity — pursued without limit. In an article I read on the South African student scene, people were complaining about how the movement doesn’t have any leaders, and that as a result, it was made to look silly. I don’t think that quality is silly. I want to defend the integrity of that aim, even though I know it is almost always abused. I want to defend that and I do think that there is a living practise of that desire which is probably as intoxicating today as it was when I was in my twenties. RB: Yes, like they always were. PG: As it should be when you are twenty and have the patience for it. For me that is the good part. But I think there is a poverty of imagination that goes with the loneliness created by the computer and the neoliberal habits which combine with the reluctance and even the refusal to read deeply, slowly and carefully. I bombard my students with reading. I refuse to hold back and perhaps they resent it. The trouble is, that if you take up these old positions about what a higher education in the humanities should involve, you end up dancing with some very conservative people. I found myself in very strange company when I began to hold out for education, not as a credentialising process, but what I think of as encouragement for the revolutionary force of individual curiosity—pursued without limit. I have to be a little bit careful about saying that this is what I really believe in. It is not the only kind of education there is, and it is not for everyone. But there are lots of people who are capable of operating in that way and who never have that special chance – and I want them to have the chance. I want to hold out for that Utopia, even now the door has been firmly shut. The problems are obvious across Europe. The University of Copenhagen is sacking 500 people. Inspired by the British, the Italian Government is now bringing in the systems Tiziana has written about for openDemocracy, ‘the university’ is being destroyed everywhere. So that is the other thing. It is not just about turning people into customers – Oxford, finishing school for the British ruling class, absolutely – Yale, country club for the American bourgeoisie, obviously – but now both of these places, all of these places are in a crisis because they are making a transition to being a finishing school or a country club for the international class, and that requires the renunciation of a certain set of parochialisms, even if some of them are pleasant, and in some instances, a kind of reckoning with elements of the colonial past. That’s where the figure of Cecil Rhodes, or Curzon, or Huxley or Churchill, or whoever it is, starts to become important once again. Long ago, I sat on some of the early rounds of the selection of Rhodes scholars, and I wonder whether the eugenic, physical vigour requirements are still operative? Rhodes’ will specified that everyone had to be fencing champions and skiers and swimmers and all the rest of it. I bet you that that is still operating. So . . . the Rhodes statue. The problem with this as Adolph Reed and a couple of other American commentators have pointed out, is that it is as though people during the desegregation movement in the 50’s or 60’s had actually wanted the forbidden Jim Crow hamburger or milk shake! They went into that space, but the food wasn’t the point! I appreciate that politics is symbolic. But is it a sufficiently transitional demand if you allow people to indulge the possibility that getting rid of the statue would put an end to anything! When Chancellor Patten answers, “If you don’t like it go and study somewhere else” – that is exactly what you would expect him to say. This is Oxford we are talking about after all! What could be more immutable than that! RB: So now we are back at Oxford, let’s just briefly return to Jörg Friedrichs and Ryan Berg and their celebratory account of the west’s movement from honour to dignity, a “major accomplishment” which sets it apart from and ahead of the rest of the world, which is now being threatened by a reverse swing of the pendulum as Oxford students who feel themselves victimised demand a new form of respect, and a sense of shame on the part of the privileged! PG: If only that were the case…! RB: Because we do have to ask, don’t we, in this account of the west as the culmination of a progressive, if undulating, history of manners — what has happened to the empire, to slavery and colonialism, the racism, sexism, oppression and class exploitation, the concentration camps, wars and killing, the impoverishment, brutalisation and neglect, the sheer trouble-making, not to mention surveillance and torture which is still going on today! Practices, in short, that figure so damningly and so pervasively throughout Domenico Losurdo’s Counter-History of Liberalism, because they were written into the western script by the finest minds, from the start? PG: For me, the answer to all of this was articulated by an earlier generation under the heading of the political philosophy of decolonisation. Fanon has, for example, had a third coming or a fourth coming now in all this, even if he is woefully misread. He said that ­– regrettably I would argue, some would say it enthusiastically – the overthrow of the colonial power has to be a violent process, otherwise nothing would happen. He said that speaking as a psychiatrist who is on the one hand helping the torturer while simultaneously dealing with the trauma of the tortured. He is committed to healing both and therefore obliged to appreciate some complementarity in their suffering, a glimpse of the new humanism yet to be born. The violence has terrible costs. The South African case seems to be a proving ground for all of this. Whether or not he was completely wrong about this will be settled now in the period in front of us. When I saw them piling up and burning the paintings in the university recently, I was thinking about his arguments. Let’s hope that that violence is not the type that we are most acquainted with, the kind that requires warm fresh blood as the medium for marking out the boundaries of political community as it comes into being. Let’s hope it is just burning paintings. RB: So in the recent battles in South Africa, they petrol bombed the Vice Chancellor’s office, according to the Vice Chancellor. But at the same time, if you read on, one girl student reports, “the police fired stun grenades and rubber bullets at unarmed students for three hours.” So, this is hardly the same as what is going on in Yale or Oxford… This is a situation where you can absolutely understand why nobody is proposing negotiation, persuasion or dialogue. PG: But you know something else, which is not mentioned there – in the South African setting, the white students, the radical ones, have put themselves, their valuable bodies, in the front row in the opposition against the police. So that the changing value of their whiteness is being negotiated in that shielding of their black peers. PG: Yes because it is all really connected. As it is to the idea of interchangeability that we started out with and the necessary sense that we are in a deep way all born into the wrong body. Persuade people of the wisdom of that insight and we might get somewhere! Persuade people that we are in a deep way all born into the wrong body and we might get somewhere! But that diagnosis is getting harder and harder to make nowadays… In the meantime, these students who are campaigning for safe spaces think that power can be challenged by moving in between contact zones and safe spaces. Militants used to say in the late 70’s, early 80’s, that the world was divided between people who wanted to change the world and thought that they themselves would be transformed in the process, and those who wanted to work on themselves first as a way of changing the world. That split has been updated. The safe space language is part of an argument about self-care as a revolutionary practise. This is warranted, they would argue, by some admittedly peculiar sources, Foucault holding hands with Audre Lorde, for heaven’s sake. The argument is that somehow in caring for one’s self, one is doing a fundamental and radical thing! That it is revolutionary—an act of warfare! I suppose in a US context where there is often no public health and people are pulling out their own teeth, self-care as revolutionary practise probably feels a little different! RB: But one of the things you lose in that particular shift in the concept of revolution, is any sense of the alliances you might have to build in order for a radical challenge to be mounted that could impact upon power. It rather reminds me of the way that national majorities in a globalising world, instead of banding together to defend their interests, manage to persuade themselves in each case that what they are is an aggrieved minority… who deserve to be returned to their national supremacy, where they used to feel comfortable and in charge. It has the same sense of the self-serving leading to self-defeat. PG: In a lot of the critiques of the protests, ‘personal offence’ as a motif comes up. But I don’t think that the Oxford protesters are personally offended by the Rhodes statue. We need to find other terms. Young people acting out and imagining how things could be different and better is absolutely fine and good. I don’t think that in this instance, it is a sense of victimhood that is the central driver. Victimisation, and the forms of prestige that are bound up with occupying the position of the victim, and the forms of moral authority that go with being able to demonstrate the depth of one’s victimisation, that is a mainstream feature of today’s culture. It saturates the culture across the board. It is no longer a matter of majorities and minorities. It is everywhere, in every television programme, in every newspaper, that is now the mainstream! Of course, the problem is that people are actually victimised, and one doesn’t want to hide that or mystify it in any way. Some of that happens through the historical forms of violence that begin with colonialism and derive from slavery which are pending in South Africa in one form, pending in the United States in another. The question is – are they pending here? And are our institutions capable of addressing that with anything other than the formulae of corporate multiculturalism, the McKinsey formula. The reason why the same formula keeps cropping up in the modernising of all these different institutions, the BBC, the elite universities and all the rest of it, is because they are all employing the same consultancies and experts… so of course they are all going to offer the same repertoire of solutions and the same rhetoric for understanding what is at stake. So to break with all that requires real work and dogged imagination, and I don’t know that either the students or the faculty are capable of accomplishing that. I called it a crisis of imagination before and I think that is what it is. Partly through fatigue, partly in deference to the impact of the ways of thinking that you have identified, there is a lack of a sense of competence. RB: There is a lot of intimidation going on for all concerned, isn’t there? PG: A lot of that is to do with the internet itself, but also with the morality of the so called call-out culture. The other side of the victim culture is the bully. One of the reasons why I have stopped writing for the internet is that I am not sure that it can handle the sort of dialogue that you are calling for. One of the reasons why I have stopped writing for the internet is that I am not sure that it can handle the sort of dialogue that you are calling for. There is something about online communication that undermines and corrupts and obscures those possibilities. We have all started confiscating the phones, in teaching, to make people, force people to be present in different ways… when it comes to this issue of really thinking something through in an accountable way, I think you and I might part company on what the internet is capable of. Chaos is the name of the game with cities and empires. The people who criticise ‘chaotic pluralism’ are never inclined to look at issues of race and conflict outside the threat they pose to the solidary impulse in a supposedly ‘healthy democratic society’. I don’t know the answer to the question of how you change the statistics on black educational performance. I don’t know why it is as it is. It is true across the board, amongst the privately educated as well as among those who go to ordinary schools. For me, that is a more important issue. It is very common these days in the public sector to be told that you have to take a course in ‘implicit bias training’ on diversity. The institution you work for wants its kitemark. It wants to be able to say, “X% of our staff have taken these courses, so if anything is still going wrong, it is nothing to do with institutional biases, the problem must go back to the schools, the homes and the expectations that the students bring with them.